President Stuart Monro presents the Clough Medal to Phil Stone. 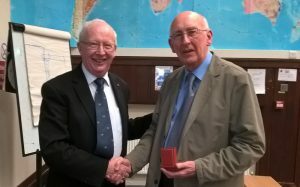 Wednesday 22 March: the Edinburgh Geological Society were delighted to present the Clough Medal for 2016-2017 to Dr Phil Stone, in recognition of his exceptional contribution to the understanding of the geology of the Lower Palaeozoic Southern Uplands Terrane and the Ballantrae Ophiolite Complex and many other achievements. The Clough Medal is the Society’s premier award, presented annually to a geologist whose original work has materially increased the knowledge of the geology of Scotland and/or the north of England, or who is Scottish by birth or by adoption and residence and has significantly advanced the knowledge of any aspect of geology. 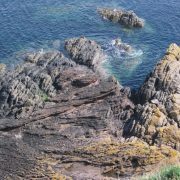 The Society is organising trips to Siccar Point during the Edinburgh International Science Festival. These afternoon coach trips from central Edinburgh take place on 9, 12 and 15 April. 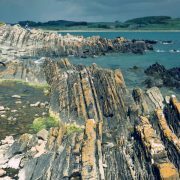 Great opportunity to visit Siccar Point with a geologist: follow the journey of James Hutton, the father of modern geology, from the site of his home in central Edinburgh to the wild coastline at Siccar Point. At this beautiful natural site Hutton’s evidence for deep time can be observed and appreciated. 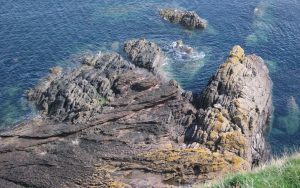 It is a short, easy walk to the viewpoint above Siccar Point. Visiting the Point itself involves a potentially difficult descent. Please wear appropriate clothing and footwear. More information about Siccar Point and James Hutton. 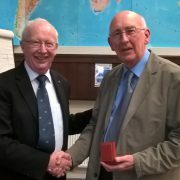 Edinburgh Geological Society is delighted to present the Clough Medal for 2016-2017 to Dr Phil Stone, in recognition of his exceptional contribution to the understanding of the geology of the Lower Palaeozoic Southern Uplands Terrane and the Ballantrae Ophiolite Complex and many other achievements. 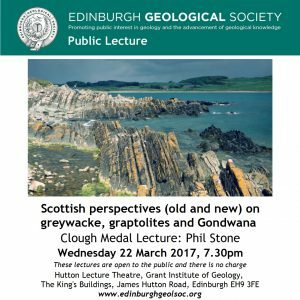 The Medal will be presented on Wednesday 22 March, followed by Phil’s lecture: Scottish perspectives (old and new) on greywacke, graptolites and Gondwana. All welcome to the final lecture of the session.